A significant reimagining and re-engraving of Johnson's Comparative Mountains and Rivers Chart. Johnson's Chart of Comparative Heights of Mountains, and Lengths of Rivers of Africa. Johnson's Chart of Comparative Heights of Mountains, and Lengths of Rivers of Asia. Johnson's Chart of Comparative Heights of Mountains, and Lengths of Rivers of Europe. Johnson's Chart of Comparative Heights of Mountains, and Lengths of Rivers of South America. Johnson's Chart of Comparative Heights of Mountains, and Lengths of Rivers of North America. This is the 1864 edition of Johnson's Mountains and Rivers Chart. This chart, printed in 1864, represents a significant reimagining and re-engraving of Johnson's pre-1864 mountains and rivers charts. Johnson first introduced a mountains and rivers chart in the second edition of his atlas, published in 1861. That chart, based on a related 1855 chart engraved by J. H. Colton, was very similar to other topical charts common in European atlases of the period in that it presented all of the great mountains and rivers of the world in a single panoramic view. Johnson, perhaps recognizing that the traditional chart, which necessarily highlighted the primacy of the great mountains and rivers of Asia, was difficult to read with regard to the regions that interested his constituent readers - North Americans and Europeans. Thus Johnson re-engraved his chart, taking the bold step of dividing the world's great mountains and rivers by continent. This curious move made the map more accessible on a continental level. 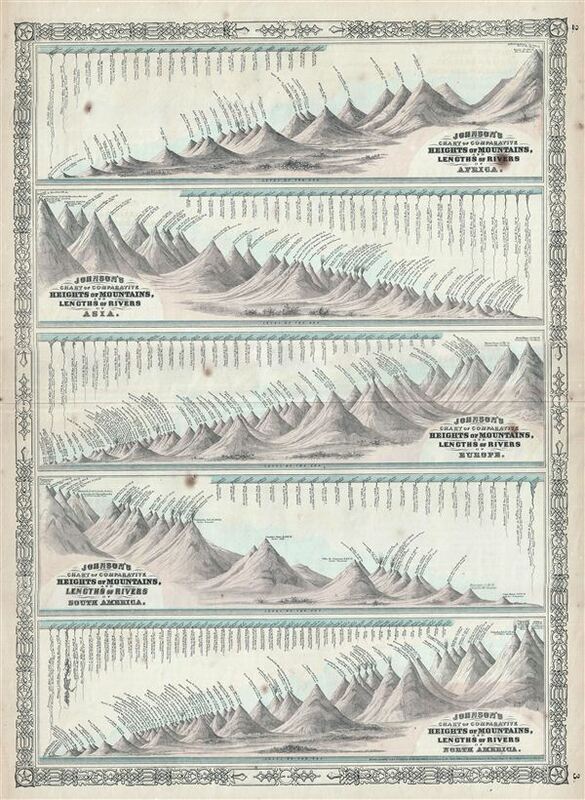 Johnson's 1864 mountains and rivers chart can also be read from a political perspective, for by dividing the mountains according to continents, each continent's mountains appear equally great. While Johnson is not the first to focus his mountains and rivers chart on particular continent, this is the first example we are aware of that consolidate the mountains and rivers all of the continents, each represented individually, on a single chart. The chart is ordered roughly alphabetically in five sections, with Africa at the top, followed by Asia, Europe, South America and North America. Curiously Johnson chooses to place North America below South America - a clear break his is alphabetical sequence. This unusual move is possibly in deference to the perceived greater importance of North America relative to its southerly cousin. In the Africa section, Kilimanjaro is identified as the highest mountain, and the Nile its longest river. This chart also includes the Great Pyramid. In the Asia second, Everest, at 29,000 feet is recognized as the highest mountain and the Yangtze as the longest river. In the Europe section, the highest mountain is Mont Blanc and the Volga is recognized as the longest River. IN South America, Tupungato (Tupungata), at 22, 450 feet is identified as the highest mountain (Aconcagua is a sad no. 2) and the Amazon is the greatest River. North America, still not fully explored when this map was published lists Mt. St. Elias, of the Canadian Yukon, as the highest mountain, followed by the Popocatepetl and Orizaba volcanoes of Mexico. This is in fact somewhat reversed from actuality, with Orizaba being the highest at 18,504 feet, followed by Elias at 18,009 feet, and Popocatepetl at 17,930. At this time, neither Mount McKinley (Denali) nor Mount Logan, the true highest peaks of North America, had been measured. Even so, Johnson does correctly recognized the Mississippi as the continent's longest river. Published by A. J. Johnson as plate nos. 2-3 for issue in the 1864 edition of Johnson's Family Atlas. Dated an copyrighted, 1864. Johnson's New Illustrated (Steel Plate) Family Atlas, (1864 edition). Johnson's New Illustrated Family Atlas was produced in numerous editions from about 1860 to 1887. Johnson's first atlas was mostly likely the 1859 edition of Colton's General Atlas which both aesthetically and comprehensively very similar to the 1860 first edition of the New Illustrated Family Atlas. Johnson's atlas was noteworthy in its day as one of the few commercially produced American atlases that could compete with more established European Atlases. Although he called the atlas 'Steel Plate' on the title page for marketing purposes, Johnson in fact incorporated modern lithographic printing techniques and lower quality woven wood pulp paper to economically produce large format maps in quantity. He also began publishing the New Illustrated Family Atlas on the cusp of the American Civil War, a decision that proved fortuitous, as the war corresponded to a general increased interested in cartography. For the most part, Johnson's Atlas was sold by subscription; nonetheless it became so popular that for at time he was considered the largest publisher in the world. Other than the first edition, the atlas itself has no true editions. Rather, Johnson incorporated updated maps as they became available, so each example of the Johnson atlas might well contain unexpected and scarce individual maps. Johnson's map of the American Southwest, for example, appeared in more than 17 different states, each illustrating minor variations to the rapidly chasing geography of that region. Moreover, Johnson's offered a service whereby he would mail updated map pages that could be tipped into older atlases to keep them current. Generally speaking, Johnson's atlas was issued in four periods - each defined by a distinctive decorative border. The earliest edition featured a strapwork border that appears as rolled and decoratively cut leather. This borderwork remained in use until 1863. In 1864 Johnson started using an updated fretwork or grillwork border that resembles worked iron - as in a decorative fence. This border was in use from 1863 to 1869. The 1863 edition of Johnson's atlas used both borders and is considered transitional. From 1870 to 1882, Johnson introduced a new border that featured elaborate Spirograph style geometric designs, which was used from 1870 to 1882. After 1880 a new border different but aesthetically similar to the Spirograph border began appearing. Certain editions of the atlas issued from 1880 - 1882 were transitional. Very good. Typical wear and verso repair along original centerfold. Texto on verso. Some foxing and overall toning.